I made these two cards up from card kits which I made up for last week's class. Check out the others here and here. 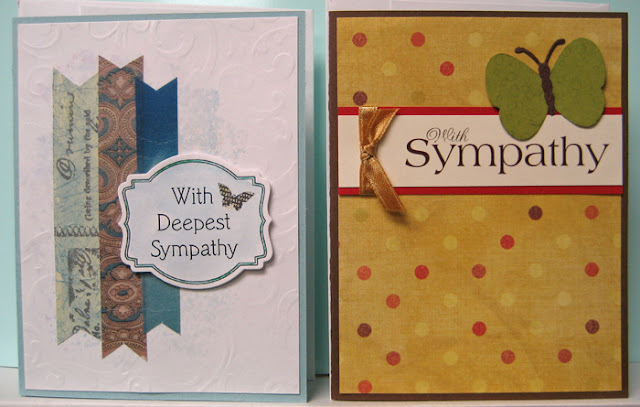 I used subtle colours on the left hand card because it is a sympathy card. I did a light blue wash on the background, added three strips of washi tape (tissue paper and double sided tape) and did some manual embossing around the edges with a hammer and a soft flourish embossing folder. I watercoloured my die cut greeting and mounted it to the front of the card using 3D foam tape. The butterfly is a digital stamp (SU). The right hand card features a quarter sheet of decorative paper trimmed to leave a bit of a border on a dark brown A2 card. I layered the laser printed greeting over a red strip of cardstock and added the short length of ribbon on the left hand side and tied another short piece to it to simulate a bow. The butterfly is a punchie (SU) which I embellished with a bit of stamping and then added a body from a QK die which features antennae as well. That will die will come in handy. Have not used that one a lot but I can see that it works very well with this punchie and probably will as well with several others I have. I mounted the butterfly using a small piece of double sided tape in the center leaving the wings free! !